UPDATE #1: Our Five Finalists have been chosen! Click here to see which five nail artists won an all-expense-paid trip to Premiere Orlando. UPDATE #2: Click here for a photo gallery of the best entries in the VietSALON Nail Artistry Competition. Professional nail artists! This is your chance to win a free trip to Orlando, Fla., for Premiere Orlando International Beauty Show June 4-6, 2016. 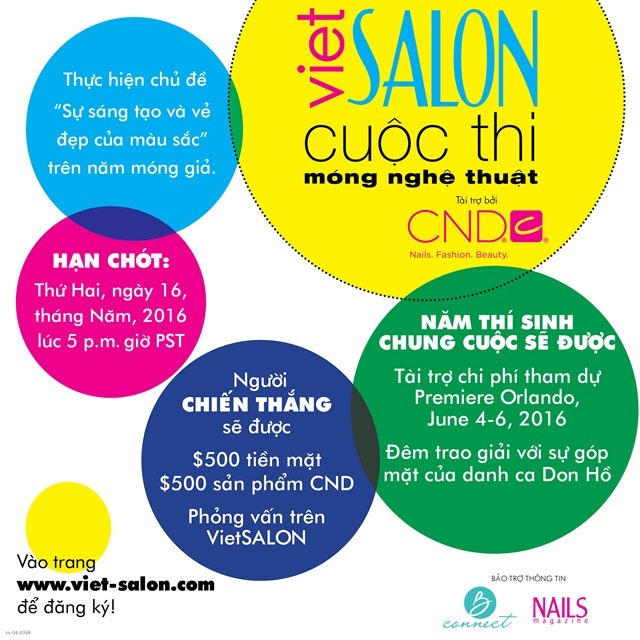 VietSALON Magazine is teaming up with CND to offer you VietSALON Cuộc Thi Mống Nghệ Thuật, the VietSALON Nail Artistry Competition sponsored by CND! Choose from any type of nail art techniques, including hand painting and 3-D acrylic sculpture, or any combination of techniques. A set of five nail tips will be designed by all competitors and judged for overall creativity and skill level. Competitors are encouraged to use their favorite CND system to create the nail design. 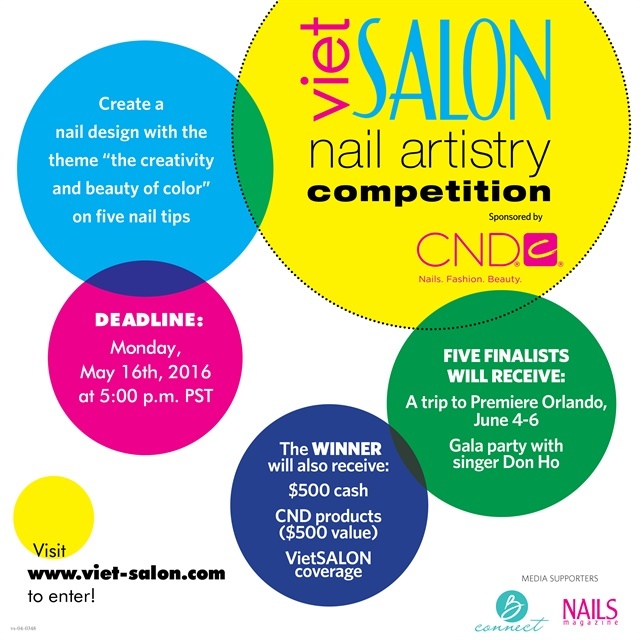 Top judges from VietSALON Magazine and CND will score the entries and select five finalists. One of these finalists will be named the winner on Sunday, June 5, at a special event during Premiere Orlando. Nail designs should celebrate the idea of the creativity and beauty of color. We encourage uniqueness and creativity. See where your imagination takes you! Five finalists will receive an all-expenses-paid trip to Premiere Orlando, Fla., June 4-6. The result will be announced at a special event featuring singer/entertainer Don Ho. This exciting Sunday evening party will include dinner, gifts, and entertainment. Finalists will also be invited to take part in a special CND class on Monday. The winner will also receive $500 cash, CND products (valued at $500), and editorial coverage in a future issue of VietSALON. Click here for rules in Vietnamese and English and to submit your nail art. Comment below or e-mail me ([email protected]) if you have any questions.